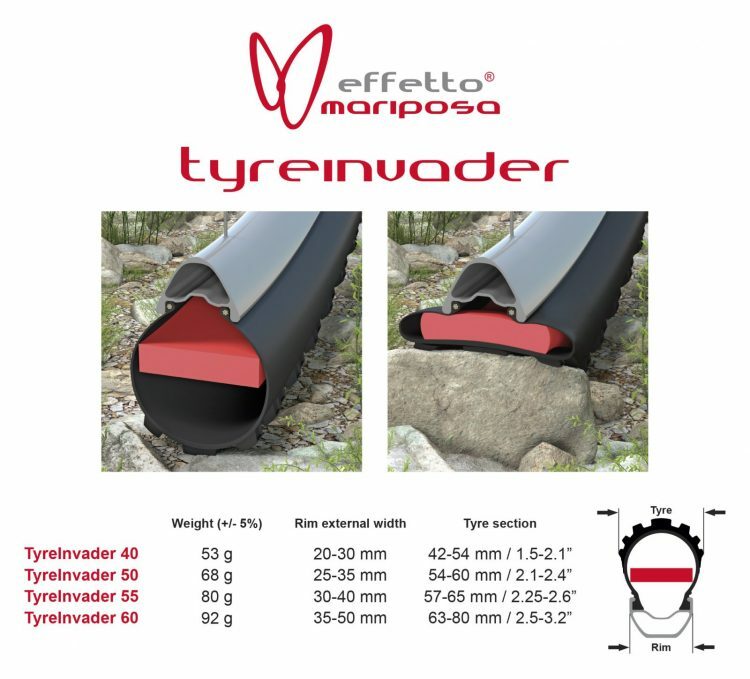 There’s a bit of news out of Italy with a new product by Effetto Mariposa, the TyreInvader. In the video above, Alberto, the owner of EM, shows us what it is and shows how to mount it. LUGANO, SWITZERLAND – Tyre inserts (a.k.a. anti-pinch-flat inserts, tyre noodles etc.) are popular in some markets, but they also are a very polarizing topic, a matter of love and hate. With Tyreinvader, Effetto Mariposa sets out to create one that stands out from the rest. Tubeless tyres (with sealant) are surely helping to keep punctures to a minimum, but they don’t totally eliminate them. With the right force, especially on rocky terrain, it’s possible to pinch-flat a tubeless tyre, cutting the tyre by pushing it very hard against the rim. Also rims can be damaged in those circumstances. To avoid that, some brands started offering tyre inserts, some flat, some round (like donuts, that’s where “tyre noodle” comes from) some with other shapes. These products have become popular among racers, especially for gravity disciplines (Enduro, DH), with some adopters even in cross country: they virtually eliminate pinch flats and – in some cases -also allow the rider to continue riding after a puncture. We list here below the main limitations of current tyre inserts, explaning how Tyreinvader is designed to overcome or mitigate them. Typical insert weight starts at 100 g and goes up to over 250 g per wheel. While that can be ok for Gravity purposes (or e-bikes), it becomes problematic for a bicycle that has to be pedaled uphill. Heavy wheels always slow down the handling, no matter the practice. Some brands encourage riders to switch to lighter tyres to partially compensate with the weight increase. We don’t agree with that, as light sidewalls offer limited protection against sharp rocks and abrasion, something inserts can’t do much about. Most inserts take up much space inside the tyre inner cavity, reducing the air volume and the influence on the tyre feel of the inflating pressure (as the insert is often compressed during normal riding, not just on heavier hits). Some other inserts take the concept to the extreme, completely filling the tyre. We don’t discuss the validity of this approach, we just chose with Tyreinvader to allow riders to use pressure as the main parameter to tune their tyre behavior. You might still feel Tyreinvader inside your wheels, so a test ride is recommended before you race with it. Some “spongy” inserts end up sucking the sealant completely… preventing pinch flats but exposing the tyre to simple punctures. 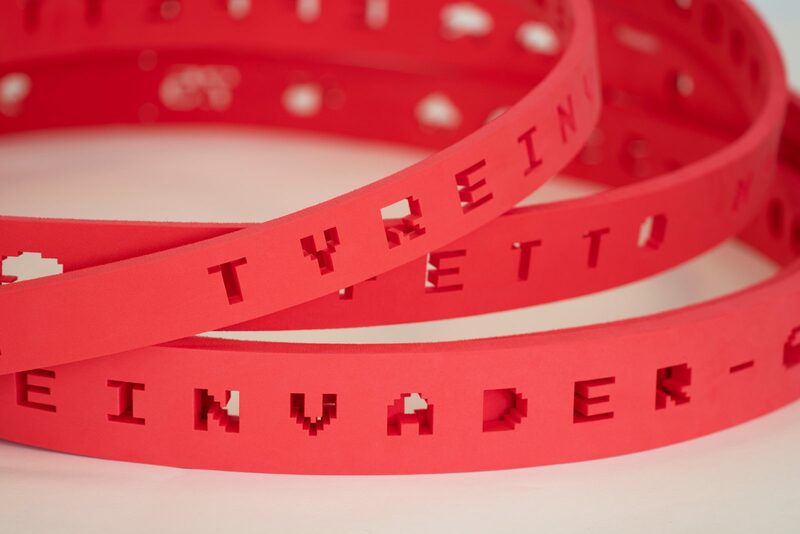 Tyreinvader is made of EVA, a closed cell polymer, and won’t absorb any liquid. As inserts have surfaces that are wetted by the sealant, a fraction of it won’t be available to move around to do its job. For this reason, also with Tyreinvader we recommend to slightly increase the quantity of sealant normally employed, by 30 ml. Tyre inserts can be very difficult to mount. Tyreinvader only requires average mechanics skills: if you can mount a stubborn tubeless tyre, our insert won’t be able to resist you! Just cut Tyreinvader following the instructions (for 27.5” and 26”; no need to cut for 29”), join its two ends with the two (provided) zip-ties, mount it inside the tyre (it will stretch a little bit to fit the circumference), add sealant, go ride. Our Tech Videos can help clear any doubt. Because of their round shape, some inserts sit on the base of the tubeless valve once mounted, and will prevent normal inflation unless using special tubeless valves (often provided by the insert maker, but normally quite heavy). Tyreinvader won’t interfere with inflation, with any tubeless valve. We’ve seen inserts destroyed after a descent in tough conditions, as some foams are not made to resist repeated impacts, just to cushion them and break in the process. We use EVA, a closed cell polymer commonly used for sport shoe soles, with very high shock absorption and great mechanical properties. There are other premium inserts with a good durability, but they normally weigh/cost much more than Tyreinvader. Rolling with no pressure in the tyres should only happen in emergency situations. In that event, inserts that fit loosely inside the tyre (often to make mounting them easier) are only pushing the tyre against the rim passively, because of rider weight. Tyreinvader is tight on the rim by design, to help keeping the tyre on the wheel in case of emergency. What about the little aliens and the arcade font? 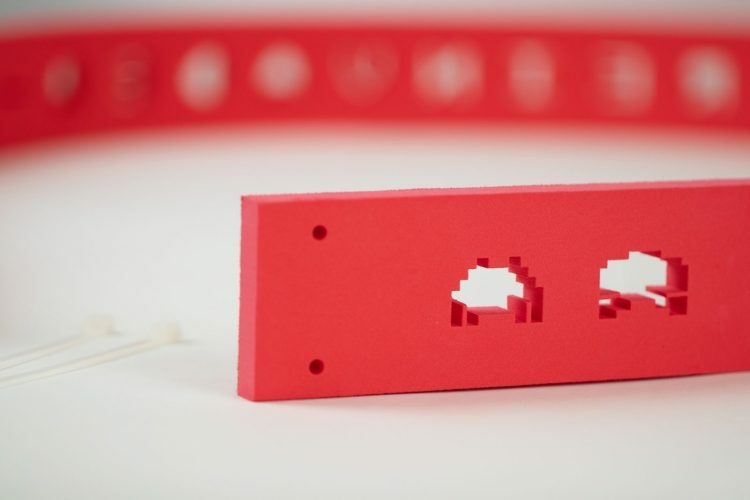 Who doesn’t remember SpaceInvaders? Even those too young to do it can learn about this piece of videogame history thanks to retrogaming. Besides, our product is actually invading the tyre, thus “Tyreinvader”. 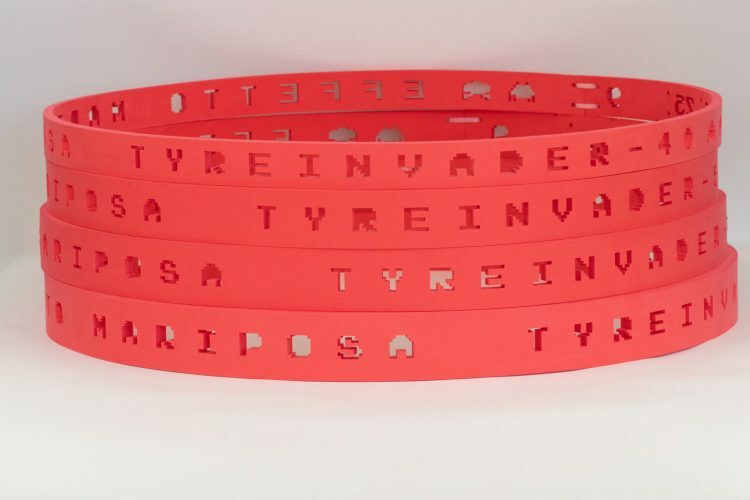 The alien-shaped cut-outs serve several purposes: to save weight, to allow easy sealant flow and, why not, to give Tyreinvader a unique look. Tyreinvader 60See chart for recommended rim/tyre widths. 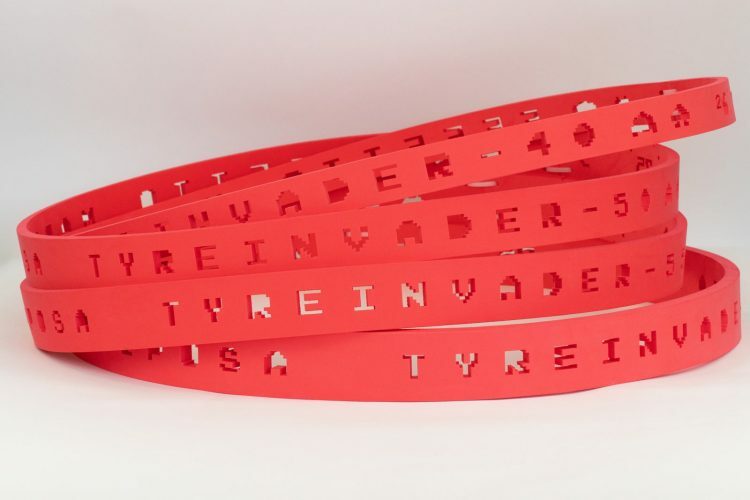 Tyreinvader starts at 39.99€ (including VAT, for Tyreinvader 40, 2 pcs. Price in other currencies TBD).